Meet Cara’s husband. Isn’t he darling? When exiting the car to attend their son’s baseball party, Cara’s Dr Pepper stopped, dropped and rolled straight into a storm drain. Sure there are several details that were omitted in this awesome email, but what I do know is that Cara’s husband was cool enough to go and fetch her beloved beverage. And Cara was cool enough to digitally capture the rescue and send it to me. 1. Why was the storm drain lid open? Was there construction? Is this a typical occurrence at the location of the baseball party? With children running around, should we be concerned? Do I need to start a letter writing campaign? 2. 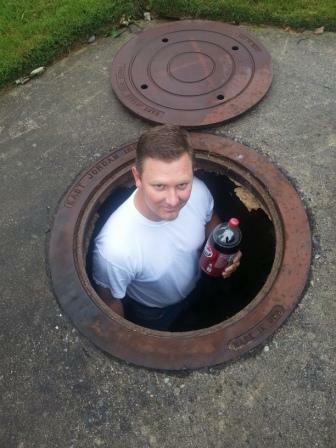 If the storm drain lid was secure, and the bottle rolled into one of those open slits on the street and ended up here at the bottom of the hole, how was Cara’s husband able to lift said lid? Is Cara’s husband a former Boy Scout? Did he prepare for such an instance by packing an extra set of drain storm tongs in the trunk of his car? Or is he really, really strong? I can vouch from watching Captain America several times now that storm drain lids can decapitate a man if hurled with enough force. Cara’s husband is a stud! 3. And how did his white t-shirt remain unscathed through this entire process? Whether he used Boy Scout tongs or brute force to lift the lid, not once did he graze the metal onto his pristine shirt? Then he scrambled down a hole to collect his bride’s beverage and came out the other side snowy white? With every hair in place? Maybe Cara’s husband IS Captain America! Y’all. Captain America’s wife reads my blog! PS: The next He Said/She Said will be up next week! There’s still time to get your questions in! I wish he wasn’t married already…. Such an entertaining little entry to read on a night when I was feeling just a tad sad that the unofficial end of summer has arrived. Thanks for the off-season smile! Love it! He truly must be Captain America! I’d still drink it. Just wash the lid before opening! There was no harm done to the actual Dr. Pepper! HAHAHA! That’s true love, for Cara and for Dr. Pepper! Captain Pepper picked a pop out of a pool of poop! A pop from poolish poop, did Captain Pepper pick! IF, Captain Pepper picked a poopish pop out of a putrid pool, where’s the poop on Captain Pepper and what’s that in your drink?